Washington D.C. (December 13, 2012) -- The American Academy of Pediatricians (AAP) which represents "60,000 primary care pediatricians, pediatric medical subspecialists, and pediatric surgical specialists dedicated to the health, safety and well-being of infants, children, adolescents, and young adults" has endorsed H.R. 6358, the Cell Phone Right to Know Act. See AAP's letter of support here. "Health effects from cell phone radiation are a potential concern for everyone that uses a cell phone, but children are among the most vulnerable as the doctors note in the letter. 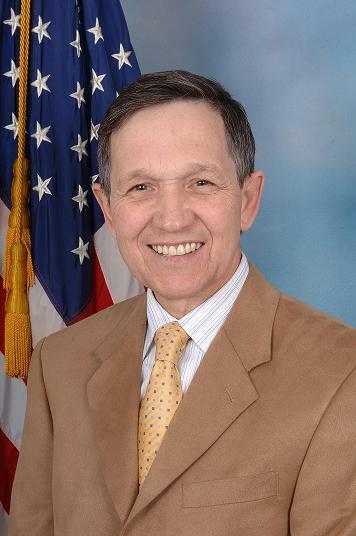 I am honored that such esteemed professionals support the Cell Phone Right to Know Act," said Kucinich. "Our coalition is growing and broadening." The Cell Phone Right to Know Act, H.R. 6358, provides for warning labels on cell phones. It would also create a new national research program to study cell phones and health and require the Environmental Protection Agency to update the outdated Specific Absorption Rate. "The AAP strongly supports H.R. 6358's emphasis on examining the effects of radiofrequency (RF) energy on vulnerable populations, including children and pregnant women. In addition, we are pleased that the bill would require the consideration of those effects when developing maximum exposure standards. Children are disproportionately affected by environmental exposures, including cell phone radiation. The differences in bone density and the amount of fluid in a child's brain compared to an adult's brain could allow children to absorb greater quantities of RF energy deeper into their brains than adults," wrote AAP President Thomas K. McInerny, MD, FAAP. Last year, the World Health Organization finished its assessment of the evidence about the links between exposure to radiation from cell phones and health problems. They concluded that there was enough evidence of a link to classify it as "possibly carcinogenic to humans," placing it in the same category as lead and mercury. The long-awaited Interphone study, a major inquiry into the potential links between cell phone use and tumors, concluded that when taken as a whole, there was not a link. However, when the data was broken down, more risk was found and the picture became clearer. Those using their cell phones typically only 30 minutes per day or more were found to have a 40% increased risk of a type of brain tumor called glioma, when compared to someone who had not used a cell phone. If the phone is used mostly on one side of the head, the risk is 96% more than someone unexposed to cell phone radiation. Other research, including research from the Cleveland Clinic, has shown links between cell phone radiation and male fertility. Cellular phones emit what is known as radiofrequency (RF) radiation. The Federal Communications Commission issues limits on those emissions called the Specific Absorption Rate (SAR). According to the Federal Communications Commission the SAR is "the amount of radio frequency energy absorbed by the body when using a mobile phone." The current limit for the maximum SAR from a cell phone is 1.6 watts per kilogram. However, the current SAR is out of date. It does not take into account modern usage and does not take into account vulnerable populations like children or pregnant women. It also assumes a person's only exposure is from the phone in use, but with WiFi, "smart phones," and Bluetooth technologies, exposure to only one wireless device is increasingly rare. Further, children's bodies are developing and have "softer" skulls that grown adults. That means that children absorb more of the radiation than adults who were studied for the SAR. "With about 300 million cell phone subscribers in the U.S., and with enough scientific evidence to show there could very well be a link between cell phones and health effects like brain tumors or sperm damage, consumers have a right to know what their phones are emitting. We must demand it," said Kucinich.